We picked up 4 wins out of the 11 races carded on Thursday, including a 3-race win streak early in the day. We had returns of $6.80, $13.00, $7.10, $21.20, $9.40 for each $2 played. But, we are looking for so much more this weekend. 1st: 4-5/3-2/1…A nice, high-end optional claimer to begin the day and I will go with Distant Shore (4), who hails from the talent-laden barn of trainer Tom Amoss. This guy has raced 4 times with a 1-1-1 resume so far. Ran fourth over the slop last time out at Churchill Downs in November. Was wide throughout in that one and tired at the end. Gets the barn’s go-to rider today and has been working lights out in the a.m. My choice. Malpais (5) goes for trainer Joe Sharp, who is still hunting and pecking for every win he can find in a race for the meet’s “Top Trainer.” This one is coming off a near-miss second here on Feb. 28. Lead from the get-go until near the wire. Horse that beat him that day is right back, in West Texas (3). All three of these have legit chances in here. I bet the 4 to win/place/show and then key the 4 over (only) the 5-3-2-1 in the exacta. 2nd: 5-6/2-3/1-4…A LA-bred, bargain bin event for the fillies and mares. I go to Flying Rosie (5), who won last time out over the slop. Beat 5 others that day. Rallied late for the win under Mitchell Murrill, who is back up for the ride today. Trainer hits with .10% of those that won the last time out. Backstage Star (6) is the horse to beat, IMO. Was third last time out to a solid performer in Star Performer. Gets away from that one today and the barn hits with .23% of the last 69 runners to make the gate. Gets a top rider back up. I bet the 6 to win/place/show (take note) and then box the 5-6 in the exacta. 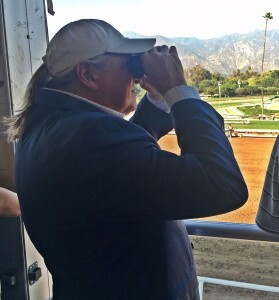 3rd: 3-5-4/6-2/7-1…This is a tough LA-bred claimer for the fillies, going 6 furlong sprint distance. I give the big edge to Lagniappe (3) in this spot. Love this daughter of Bind, who won two races back. Went wide last time out, while stalking the pace, and had nothing left at the end. Look for the new rider to put her on or near the lead today. I bet the 3 to win/place/show and then box the top 3 numbers in the exacta. I key the 3 over the 6-2-7-1 in a smaller version. 4th: 1-4-6/5-2/3…Another claimer for the LA-breds, and this one will be for the 3YO colts and geldings. Nippy Red (1) draws the rail, which is producing winners at a .19% rate at this 1-mile distance this meet. Finished third the last time out when facing open company. Gets back against State-bred only today. Point the Way (4) goes for a new trainer today after being nabbed from the claim box last time out. The new barn hits with .20% on the first try after the purchase. Gets a top dirt rider up, and will be coming late. I B Revolutionery (6) drops considerably in the price category for this one today and the barn does have a 4-2-3 record in 34 starts this meet. Rider is red hot and stands atop the jockey standings here this meet. Look for more out of this one today. I bet the 1-6 across the board and then box the top 3 in the exacta. 5th: 5-8/(10)/4-6-3/2-1…A 5.5-furlong turf sprint is the calling card here, and I will go with Uncle Young (5). This NY-bred has been running against open company in the last four tries and has won two of them in a row. Was claimed out of the last one and the barn hits with .15% of the new ones to the barn. Love the fact that the rider sticks with the horse, despite the new connections. Good right now. Voodoo Spell (8) is a horse that we have touted in the past. Has run second in two of the last three tries. Goes for a trainer who has won .21% of the last 197 races he’s been in and this one has a 5-4-2 mark in 14 tries here over this course. Veteran loves it here. I bet the 5-8 across the board and then box those two in the exacta. 6th: 9-5…I only like two horses in this MCL event for the LA-breds. I give the edge to Brahms’ Regal Gal (9), who has not missed the board in three lifetime tries to date. Drops to a career low level and gets a route distance for the first time. Barn only hits with .08% of those stretching out. Bothersome. But gets the services of James Graham, a top rider here this meet. Over Tipped (5) has not been close in either of the first two tries, but loses the blinkers today. Barn hits with .25% of those losing the shades. Barn loves the stretch out in distance, too. Hits with .38% of those routing for the first time. I bet the 9 to win/place and then box the 9-5 in the exacta. 7th: 13-4-5/12-8/9-14…This grass event will be contested at the 1-mile distance, and I will go to the outside and land on Havinfunyet (13). Horrible post, and that hurts her chances in this one. But she does come from far off the pace and has 7 wins in 12 starts over this course. At the distance, she is 7-4-0 in 13 starts. Hard to beat those numbers. Gets a top grass rider up and that should help, as well. I bet the 13 to win/place/show and then box the top 3 numbers in the exacta. I key the 13 over the 12-8-9-14 in a smaller version. 8th: 4-6-1A/8-5-7/1-3-2-9…This is an allowance event for the LA-breds only. Will be contested at the two-turn distance of 1 mile & 70 yards. I go to Big Boy Dave Rex (4), who is coming off a second in a State-bred Stakes event down at Delta Downs the last time out. Nearly closed well enough to win. Has hit the board in 6 in a row and 7 of the last 8. Sharp work here on March 16. Zenucci (6) goes for a red-hot barn and a hotter jockey. They have combined to win with 4 of the last 10 mounts together. This one was claimed two starts back and he nearly moved up to win an allowance here on Feb. 24. Beware. Zippy (1A) nearly won at this same level last time out when converting back to the dirt surface. Has a win and two seconds in 4 starts here. Will be pushing the pace from a nice stalking position, and may get the first jump. I bet the 4-1A to win/place/show and then box the top 3 numbers in the exacta. 9th: 12-2-7/6-10/4-11-5/8-13…The last turf race of the day, and once again I find myself on the outside with my top choice. Don’t like it there. But like the horse. Tupelo Hon E (12) is trained by Brendan Walsh and ridden by Adam Beschizza. The two of them have won each of the last two trips together. Was beaten less than 2 lengths in a MSW event here on Feb. 9. Gets dropped into the MCL ranks for the first time today. Barn scores with .17% of them doing that. Will run from off the pace, and will need some racing luck and room. She’s Divine (2) drops into the MCL ranks for the first time, as well. Trainer hits with .34% of them doing that. Ran poorly over the slop last time out, but that was an exercise trip. Gets back to the grass today, and did run two seconds in a row to start the career. Could surprise and is my Upset Special of the Day. I bet the 12-2 across the board and then box the top 3 numbers in the exacta. 10th: 6-11/9-5-10/2-4-1-8…The last trip around the oval today is a MCL event for the LA-bred fillies. I go to Deal Fever (6), who is coming off a 5th place finish last time out. That was in the MSW ranks, though, and she gets dropped all the way to the $12,500 price tag today for a top barn operation. They paid $65,000 for this daughter of Union Rags. Had a nice work on March 16 over the slop here. Looks ready to pop at this level. May be worth the price tag here. Untuttable Speed (11) goes for a barn that has been cold all meet. But the trainer has hit with .19% of the last 219 horses to make the gate. This one has three thirds in the last four tries. Should be close again. I bet the 6 to win/place/show and then box the top 2 in the exacta.